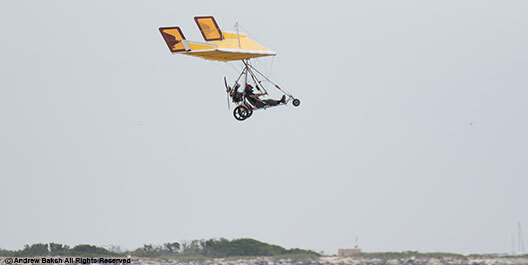 On Sunday July 10th, for the most part, I had the flats at Cupsogue LI, all to myself. This was like reaching moksha for me as I tend to do my best work when I am alone, at peace and not inundated with incessant chatting. It is one of the reasons why I often bird alone. I birded both tide cycles and was lucky enough to find a couple of good birds on that day. 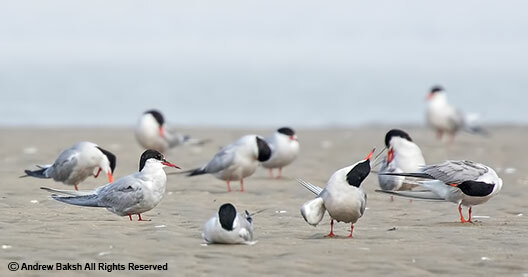 It started with a 2nd Summer Arctic Tern (Sterna paradisaea). This bird was not easy to keep track of and I quickly lost it after picking it up on one of the far bars. After working the Tern flock over for about 30 mins, I refound it again quite a ways from where I had originally found it. It appeared that I had a stealthy one on my hands. I subsequently lost it again and it was not until the afternoon falling tide (my second tide cycle of the day) that I was able to refind and this time I was lucky to keep track of its movements thus getting good study time with it. During the earlier tide cycle while trying to relocate the 2nd summer Arctic Tern, I found another Arctic Tern, this one a 1st Summer Arctic Tern. This bird was easier to keep track of since there were only 2 other 1st Summer Common Terns in the flock and I was able to study and document it to my satisfaction. 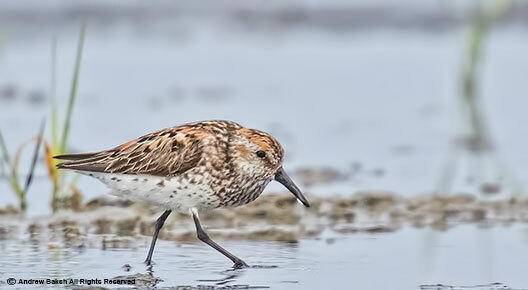 The other good birds I found that day were two Western Sandpipers (Calidris mauri). One of them was in very nice breeding plumage and I was excited to be able to document and study this bird at length. 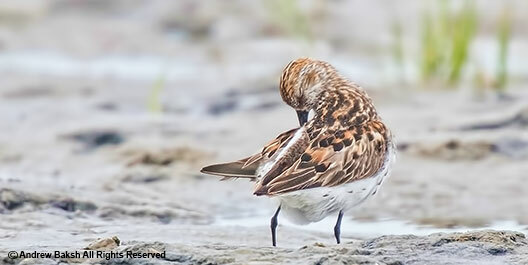 Western Sandpipers molt very quickly and often we get them when the rufous is pretty much gone in the plumage. I have included several photos for review, enjoy! Ruddy Turnstone with a Geolocator. 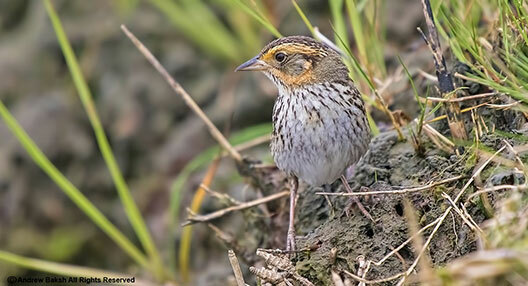 On Saturday, I spent most of my day birding the Cupsogue flats in Westhampton LI New York. I started my day with Seawatching, which was a bust and I bailed after fielding a few questions from locals on what I was looking at. I got onto the flats on a falling tide sometime after 8:00 a.m. and subsequently spent 8 hours birding. There were not many birds but I did enjoy my time studying those that were present. Of note, was my first banded Roseate Tern that I was able to read the coded ring. I submitted the band code to the bird banding laboratory and now I am awaiting the details. Do it yourself Aircraft. I wished then the Terns would attack and bring this monstrosity down. off-leashed dogs and low-flying commercial aircraft. I counted the number of times birds flushed as a result of each of the variables listed and I tallied 15 instances of disturbances. This is a high number; especially for migrating birds whose goal is to stuff themselves in an effort to gain enough weight for the next leg of their journey to their wintering grounds. When I observe these events, I am saddened that we have so little protection in place for these birds - but the truth is, we are to blame. The average birder is more interested in a tick for their life, state, county or patch list and spare little thought about the welfare of the birds overall. And it should be noted that some organizations who are supposed to be looking out for the welfare of birds are just as guilty. You would think that with the marsh at Cupsogue being such a great spot for breeding Saltmarsh and Seaside Sparrows, something in the form of signage would be in place, alerting dog owners about the dangers these birds face from Fido running off-leashed. That is not the case and Saturday, I had to intervene when a gentleman allowed his dog to run rampant through the marsh scaring up breeding Eastern Willets, Saltmarsh and Seaside Sparrows. Luckily, my reasoning resulted in him seeing the error of his ways and he left shortly after with his dog in tow. But what happens when no one is around? Do you see what I am getting at? At the very least, signage, I would like to think would give pause to the would be offender (s). Ask any birder, when was the last time they wrote a letter or engaged in some sort of activism to protect birds and you will probably get the usual excuses. Those of us who engage in such activities are often very discouraged and many times it puts us at odds with folks who would rather keep us silent. But we keep on, like an annoying drip. Plugging away and if we save one bird with our madness then I am content to continue the madness. Birds need all the help they could get from us.